Quilting With Thistle Thicket Studio: IG Happy Mail: Lilla! Oh my lucky stars! Look what arrived yesterday in my mailbox! 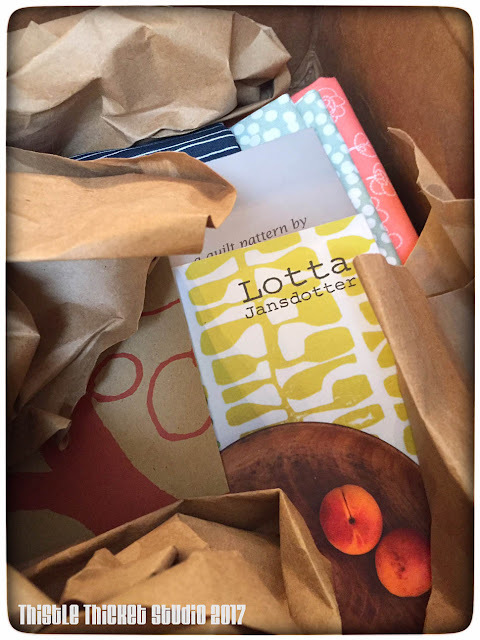 Happy mail from Lotta Jansdotter! Lotta is a fabric designer. Her designs are organic yet sleek and urban. Her latest collection, Lilla (which means 'little' in Swedish), for Windham Fabrics was delivered to shops this spring. As part of the release, Lotta held a giveaway on Instagram recently and guess who was lucky enough to win one of her prizes! 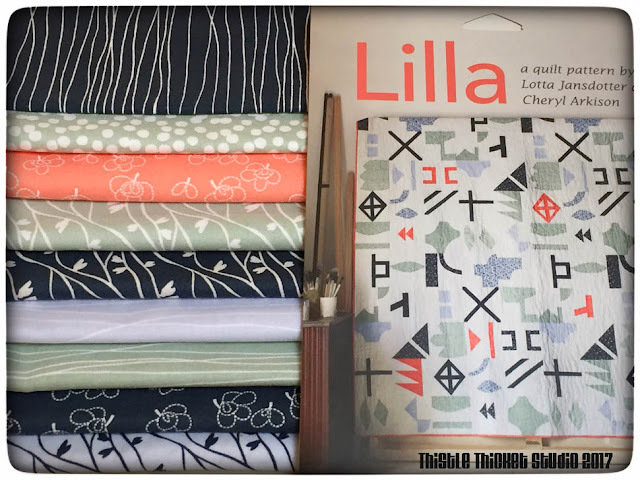 And here's my winnings - a Lilla pattern by Lotta and Cheryl Arkison, plus 9 yards of Lilla fabric, enough of the feature fabric required for the pattern. I've been wanting to learn how to sew curves, so this pattern may be quite fun. I actually joined The Modern Quilt Guild last week as an at large member, so this may be the perfect project to celebrate my new membership. Speaking of the MQG, I participated in my first event as a member - a webinar on fabric design presented by Kim Kight, founding designer for Cotton + Steel and author of "A Field Guide To Fabric Design". It was very interesting and I hope they have more webinars like it in the future. Now, I'm off to climb on the combine and cut some wheat! Fantastic win ! The fabric is lovely . Real earth colours - now go cut that wheat ! What?!! My First Design Client!